Muhammad Ali and Me add [read review] is the coming-of-age story of a young, black, gay girl growing up in foster care, and her fantastical friendship with the legendary boxer Muhammad Ali, ‘The Greatest’. 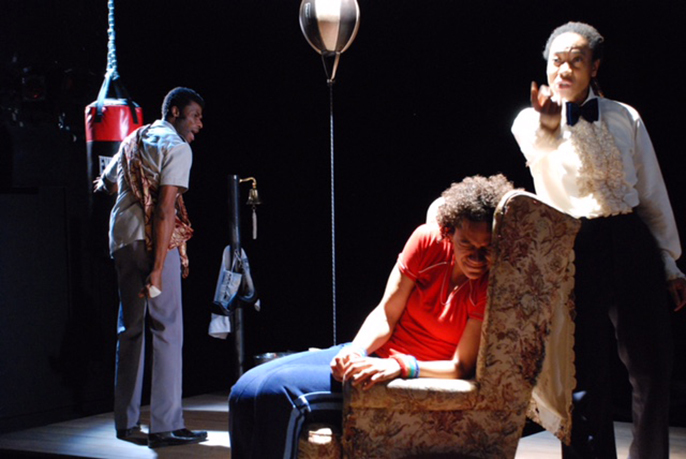 After sell-out performances in 2008 at Ovalhouse theatre in London, a revised version of the play returns for a ten show run at the Albany in Deptford and a national tour of boxing gyms. Written and performed by acclaimed writer and actor Mojisola Adebayo with the Ali Collective, Muhammad Ali and Me is staged in memory and celebration of Ali who died in April 2016. humorous, immersive and powerful. Powerful, immersive and humorous, Muhammad Ali and Me combines spoken word, dance, boxing, African A Capella singing, original footage of Ali’s fights, animation, pyrotechnics, magic and 1970s black pop music. In a semi-autobiographical exploration of gender, identity, race and religion, Adebayo plays both the protagonist, Mojitola, as well as Ali at different stages of his life. Directed by the choreographer and theatre director Sheron Wray, the play also stars renowned actor Charlie Folorunsho, and Jacqui Beckford who integrates BSL (British Sign Language) interpretation into her performance at every show. Mojisola Adebayo is an international performer, playwright, director, producer and teacher concerned with power, identity, personal and social change. Her wide and diverse work has ranged from being an actor with the Royal Shakespeare Company to co-founding VIDYA, a slum dweller’s theatre company in Ahmedabad, India. In 2005 playwriting became her primary focus, including her landmark production, Moj of the Antarctic: An African Odyssey, which was researched in Antarctica in 2005 and performed at Lyric Hammersmith, Oval House Theatre, Queer up North and had a British Council African tour. This was followed by Muhammad Ali and Me (Oval House) and I Stand Corrected, commissioned by Artscape, South Africa (Oval House). Talks at The Albany: Saturday 8 October (pre-show) 5pm: Black Queer Theatre A debate with guest speakers. Tuesday 11 October (post show): More than a Woman: staging LGBTQI+ identities. Wednesday 12 October (post show): Fight the Power: black masculinity and Islam on stage. 21 October; Hockwell Ring Amateur Boxing Club, Hockwell Ring, Luton, LU4 9NG. 1900. Age 11 years + Tickets from www.mojisolaadebayo.com or on the door by donation. 22 October; Woking Amateur Boxing Club, The Community Building, Woking Park, Surrey GU22 9BA. 1900. Age 11 years + Tickets from www.mojisolaadebayo.com or on the door by donation. 24 October; Spotlight, 30 Hay Currie Street, Langdon Park, London, E14 6GN. 1830. Age 11 years + Tickets from www.mojisolaadebayo.com or on the door by donation. 25 October; Derbyshire Hill Youth Centre (YAZ), Derbyshire Hill Road, St Helens. 1900. Age 11 years + Tickets www.eventbrite.com By donation. 27 October; Blackburn Cobras, Abc Boxing Club And Fitness Centre, Forrest St, Blackburn BB1 3BB. 13.00 Matinee for women only (access via stairs - no lift) Performance for women and girls with Urdu scene synopsis. 19.00 All welcome (access via stairs - no lift). Tickets from www.eventbrite.com or on the door by donation.